ALL ICE: These white walls are all perishable, and will eventually melt down before the summer. 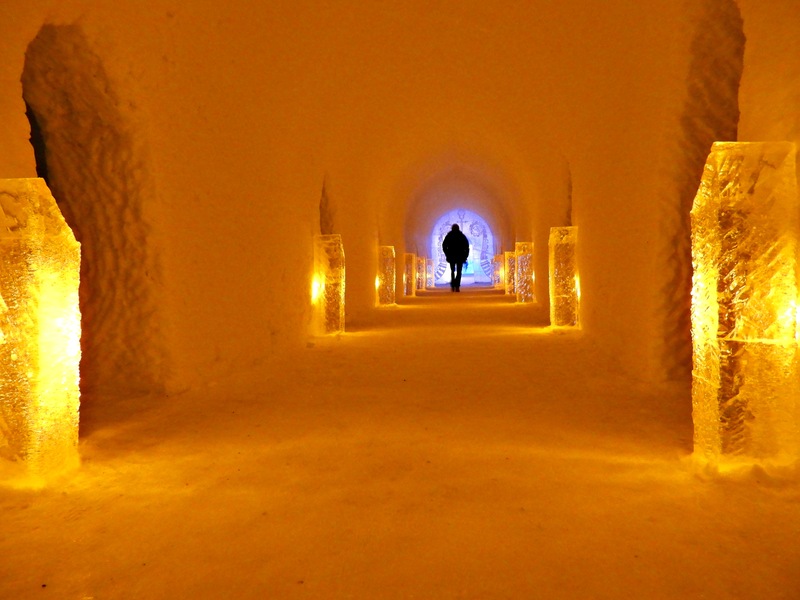 Snow castle, ice hotel or igloo hotel. They may have different names, but in the extreme northern parts Scandinavia you find quite a few of these cold, artistic establishment, that melts down every spring, and is rebuilt every winter. 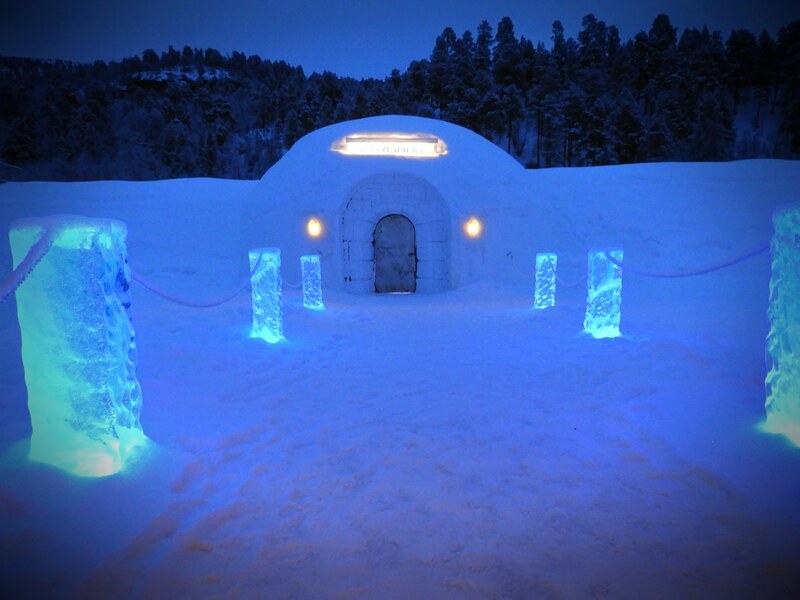 THE ENTRANCE: The igloo is situated in walking distance from the reception and restaurant building. TEMPLE: There are even space for a prayer inside. Photo: Torill Tomren. Guests are coming from all over the world to visit the igloo hotel in Sorrisniva, 20 kilometres from downtown Alta. 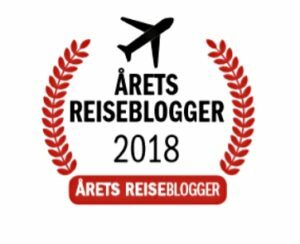 Even though more and more Norwegians are starting to discover the exoticism in our own country, many of us will still hesitate to stay in a hotel with a stable temperature below zero. As a native Norwegian we are quite used to all things that can be related to, and associated with ice, coldness and snow. Most of us have already, by the age of ten, the experience of spending the weekend or Easter holiday in a wooden mountain cabin – without electricity and all that come with the lack of this. We also have the memory of our parents saying «But, this is soooo oh nice! Relax and enjoy the sileeeence». For many of us, these childhood “holidays” often went into our memories as a lesson of how to survive the lack of everything that had to do with modern facilities. When you grow up in a place where snow and ice cover the field and your harbour half of the year, staying in a hotel built of ice, is not the first priority when it comes to spending the money. We´ll rather go to Spain, Greece or Australia. As we grow older, we realize the truth in the words from our parents; The values and things you learnt as a kid, you will most certainly come back to you as an adult. 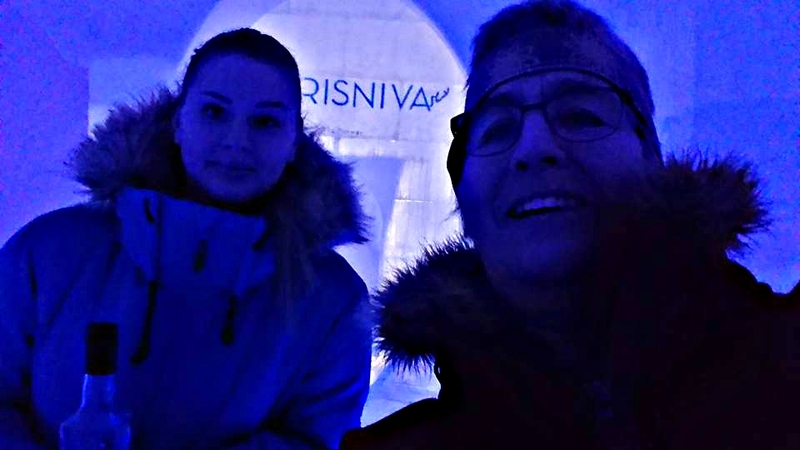 So, what is more natural than visiting an igloo, for someone born in a country surrounded by ice and snow half of the year? After years of spending our money and holidays in warm, exotic places, we realize that we have some quite excellent places back home, sometimes almost in our own back yard. This is why most of us find the igloo hotel in Alta amazing, even though we spent hours digging our own snow caves as kids, almost freezing our fingers off while longing for the summer heat. CARVINGS: Every year there the managemnet chose a new genre of sculptures and carvings. 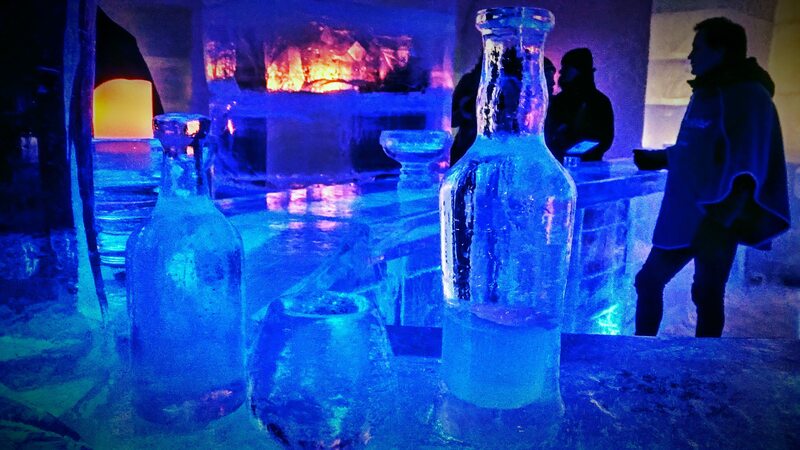 THE ALLEY: In the very end you find the Ice bar, serving the blue iced «Mooni». 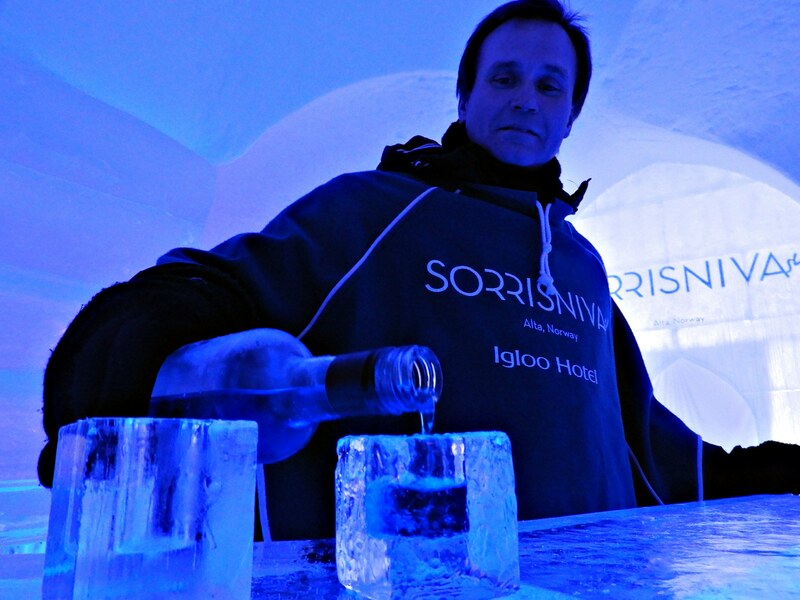 Every winter, valuable time and money are invested to build the igloo hotel in Sorrisniva. 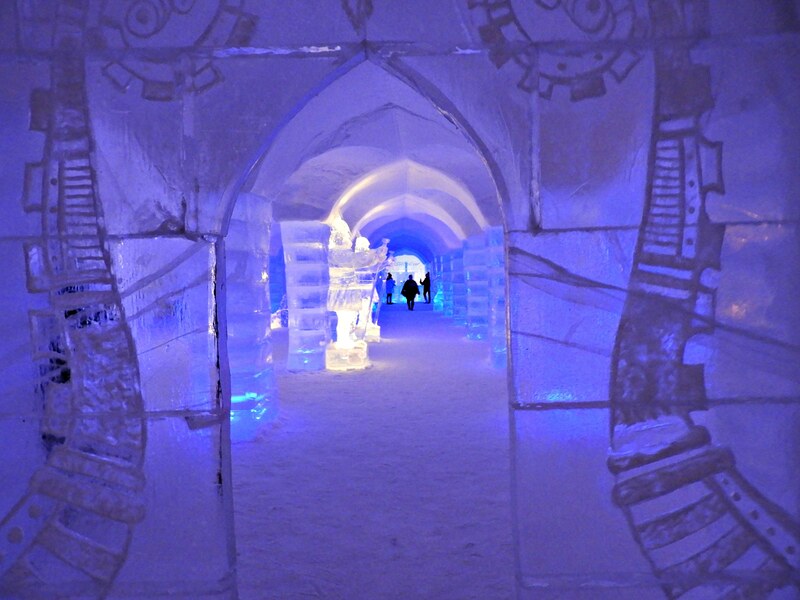 −We spend 4-6 weeks building the ice hotel, and have 20 people in work during this period. 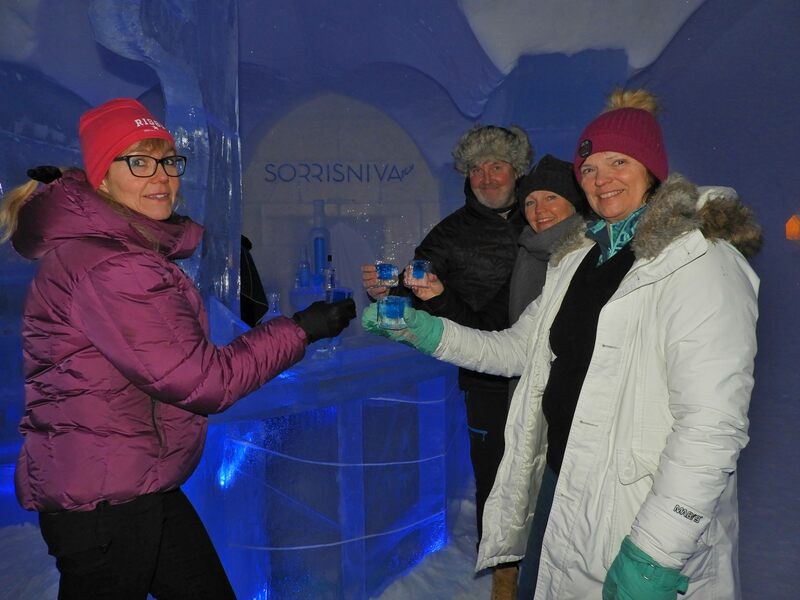 They are all locals, and most of them have other professions the rest of the year, explains Ida Marie Thomassen, booking and marketing manager in Sorrisniva. During the construction period, local artists spend their time and professionalism in the construction of ice sculptures and wall carvings. They even build up a real bar with a bar desk, sitting area, bottles and glasses. The only material is frozen water from the local river. By the end of the season all these will eventually fade away. They constructors and owners know it will happen, and still they build it up every year. 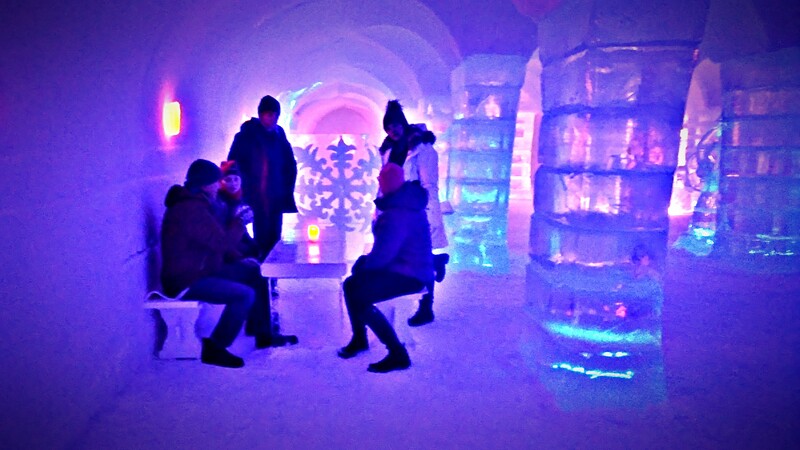 This is what I personally find so impressing with the ice hotel. DETAILS: Even bottles and glasses are made of ice from the nearby Alta River. COOL CAFE: My friends having av break in the»sitting room». Sorrisniva igloo hotel was the first igloo hotel in Norway. It was also number two in the world when it appeared for the first time in 1999. First out was the snow hotel in Kemi in Finland, which was built for the first time three years earlier. The Sorrisniva igloo hotel is situated in the back yard of the reception and restaurant building, which is a separate wooden part of the complex. As Sorrisniva also offer local food and different safari and activities, there has to be a permanent building with facilities that do not have to be rebuilt every year. To get to the igloo hotel, we walk through the back door of the reception, and follow the snowy walkway leading to the igloo entrance. 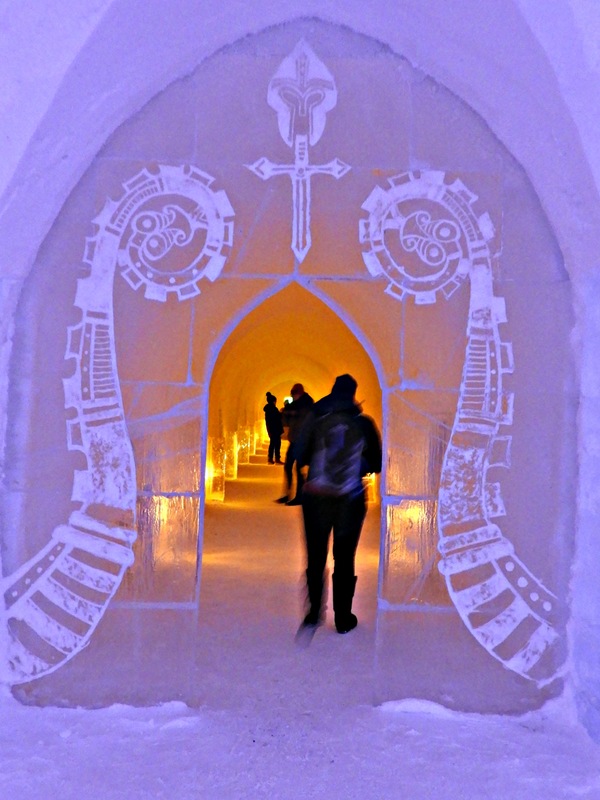 Behind the door, we enter a long indoor alley, with orange light and beautiful ice carvings on the walls. It is all packed in 2500 square meters of snow and ice. Every year a new theme for ice decorations is chosen inside the hotel, where Nordic myths, Vikings, legends and local wildlife are popular genres. The left side of the iIgloo is reserved for overnight guests. In this section you find 26 guest rooms and four large suites. 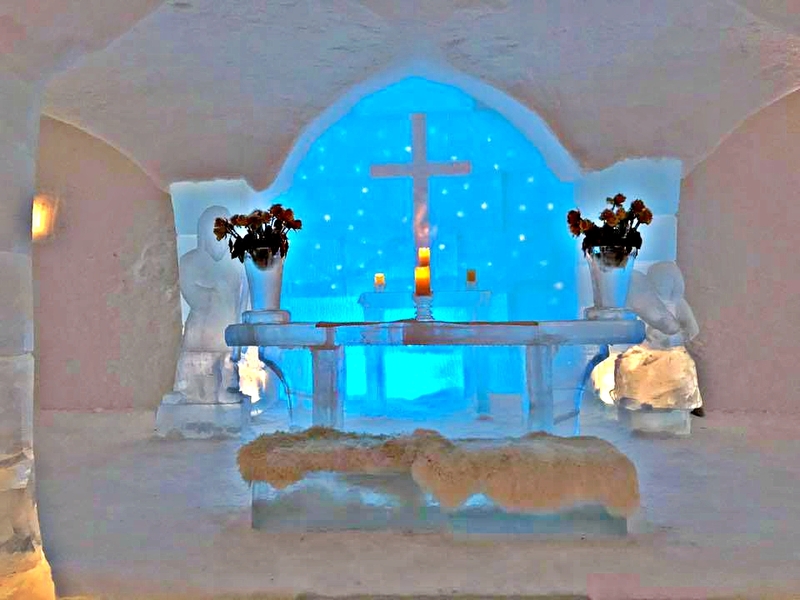 In the middle of the igloo there is a chapel, with beautiful ice sculptures. Finally, but definitely of great interest, we find the bar. −Are you in for a cold drink? asks Jan Roger Eriksen, sales and marketing manager at the hotel. Standing behind the almost transparent bar desk of pure ice, he is holding up a bottle of clear blue content. The drink, named “mooni”, is the speciality of the hotel, and is served directly on ice. The small square glasses are also made of nothing but ice from the river. Bringing the drink into the wooden building next door, is surely not a good idea! MOONI TIME: Manager Jan Roger Eriksen serving the local drink. Don´t bring the glasses inside the recetion building unless you want your drink mixed with water. CHEERS: Ellen, Tone and Torill enjoying the «Mooni» at the bar. The temperature inside is between minus 4 and minus 7 degrees below zero. If you want to spend the night in these cool surroundings, you will receive a sleeping bag or two, and a reindeer skin. The latter is to be placed on top of the bed of ice. An unforgettable night, say those who have done it. Unfortunately, I did not have the time to stay overnight. But our friends from the Southern Norwegian town of Larvik did. −First we had a delicious four corse dinner in the restaurant, with local specialities like dried raindeer heart, fresh shrimps form the region, bear meat and cloudberries for dessert, explains Kirsten Sundby Foldvik. When dressing up for the night, they had to put on woollen clothes and a night cap to wear at night. On the way out to the rooms and the bed, they picked up two sleeping bags and a pillow. The sleeping bags were made for temperature down to -30. While sleeping in one of them, the other sleeping bag was put on top as an extra comfort. – It was minus four degrees, but I did not feel cold. It was impossible to get cold in the sleeping bag. Still, when walking over the 20 metres to the ladies room in the reception building, we felt the temperature was higher outside than in our «room”, she says. After falling asleep, Kirsten and her friend Jorunn slept very well through the night. 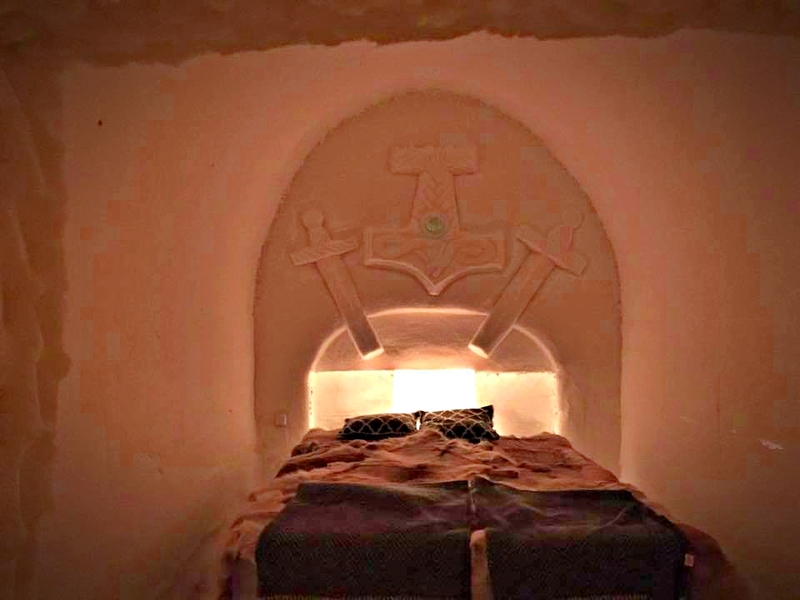 − We did not even hear our friend Øyvind snoring in the room next door, something I am quite sure he did, says Kirsten. Next morning they walked over to the reception building for a nice the hot shower and sauna. −And then we had an absolutely delicious breakfast, with local food. This made a prefect start of our day, explains Kirsten. OVERNIGHT GUEST: Kirtsen Foldvik Sundby (right). Private photo. ARCTIC NIGHT: Not the worst place to spend the night, right? Photo: Torill Tomren. Sorrisniva is located in idyllic surroundings on the banks of the Alta River. The company is run by two brothers, Hans Ulrik and Tor Kjetil. They were born on the shores of the Alta River, surrounded by dense forest. Their father founded the company in 1989, and when his health failed they left their jobs to run the business. Since 2004 the guests can enjoy a cozy fireplace, sauna, outdoor Jacuzzi and fabulous meals in the service building next door to the igloo hotel. The season normally lasts from the middle of December to early April. Depending on the temperature, of corse. 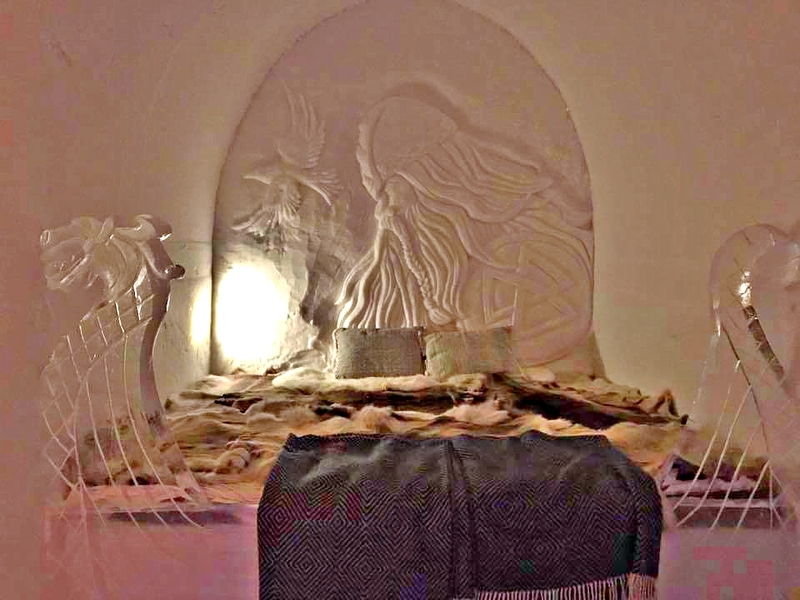 LUXURY: Some of the beds come with ice carvings and sculptures. Photo: Torill Tomren.